Manjuyod is a marvellous virgin sand bar 7 kilometers long. If you want to spend the night in one of the few bungalow over the water you will have to check the tide calendar. Staying in a overwater bungalow it's an incredible experience. The beach will be at your complete disposal, there will be no noisy tourists, you'll be surrounded by the beauty of the blue sky and by the turquoise of the water where you'll see fishes of thousand colors and dolphins! Yes, you will be able to swim among dolphins, a luxury that few can afford! And you will be able to spend the night lulled by the waves of the sea and under a magical starry sky. You can book one of the few touristic bungalows with us. On the island, beside those bungalows, there is nothing else. Even if this place is known as "The Maldives of the Philippines", you will not find resorts or hotels, nor restaurants or bars. But you have chosen Manjuyod Sandbar for its wild nature. No luxury suites with all the comforts, no transparent crystal floors to observe underwater life, and no comfy king size beds. Bungalows here are very spartan, they are piled on water, there is neither light nor running water and they offer basic services, so you will not miss a detail of the surrounding landscape. In order to spend the night in the Manjuyod Sandbar you will just have to remember few simple things and organize accordingly. Cottage rental is at 5,000 PH Pesos for daytime use. Overnight rate is 4,000 PH Pesos and 24-hour use is 9,000 PH Pesos. Do not expect anything else. this is the reason why there are few tourists staying overnight. Most of them prefers to eat on the boat, enjoy the island during the day and go back to Dumaguete or Bais for dinner. In the Manjuyod Sandbar there are no restaurants. You can find local sellers on the beach during low tide. They sell fresh fruit and coconuts. Bring food with you, and if you plan to spend the night here, it's necessary that you bring water with you. On the island there is no electricity, so you might bring flashlights and external batteries for your mobile phones, and a first aid kit. 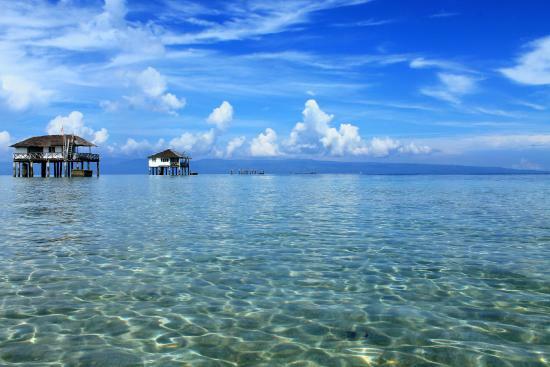 Once you decided to stay overnight in Manjuyod Sandbar, you'll have the magic of a heaven on earth only for yourself. The night will fall on your dreams and will give you silence and thousands of stars. You have never seen a sky like this! The moon will light up the sea and the dawn will wake you up with a thousand multicolored fish peeping under the bungalow! Diving into crystalline water will be your best good morning and will give you a unique and unforgettable experience.